Click any city in the interactive map to view its graph. 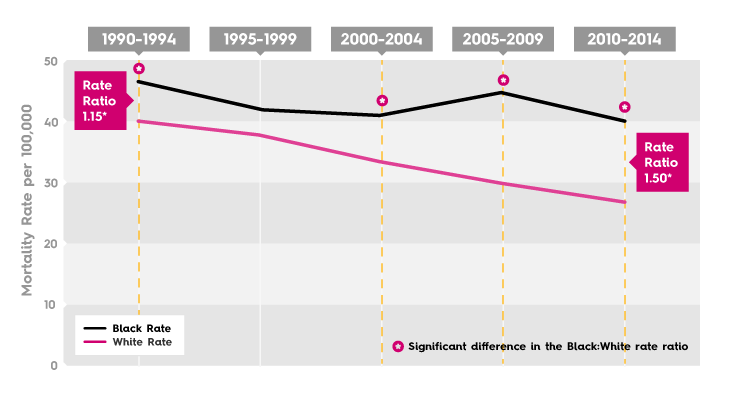 Each graph presents the mortality rates for black women (black line) and for white women (the pink line) from 1990 through 2014. See the U.S. graph, review the study’s top-line findings and read our press release. This study was conducted by Sinai Urban Health Institute and Breast Cancer Research Foundation, and funded by the Avon Foundation for Women. Integer posuere erat a ante venenatis dapibus posuere velit aliquet. Fusce dapibus, tellus ac cursus commodo, tortor mauris condimentum nibh, ut fermentum massa justo sit amet risus. Morbi leo risus, porta ac consectetur ac, vestibulum at eros. 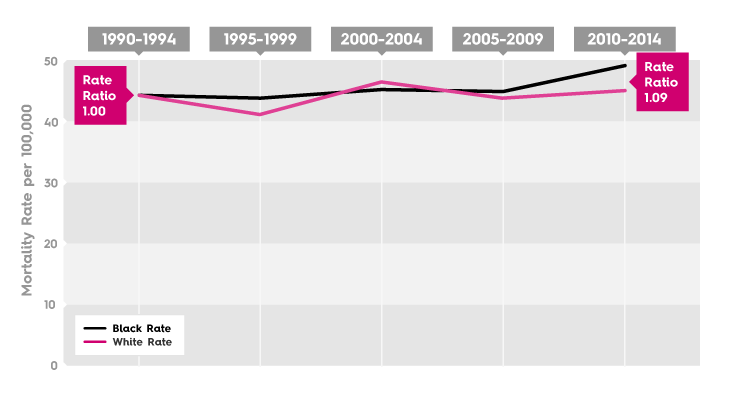 During the first 5-year interval (1990-1994) across the US, the Black rate was 37.5 and the White rate was 32.0, which produced a rate ratio of 1.17 (statistically significantly different). During the last 5-year interval (2010-2014), the Black rate was 30.7 and the White rate was 21.4, which produced a rate ratio of 1.43 (statistically significantly different). 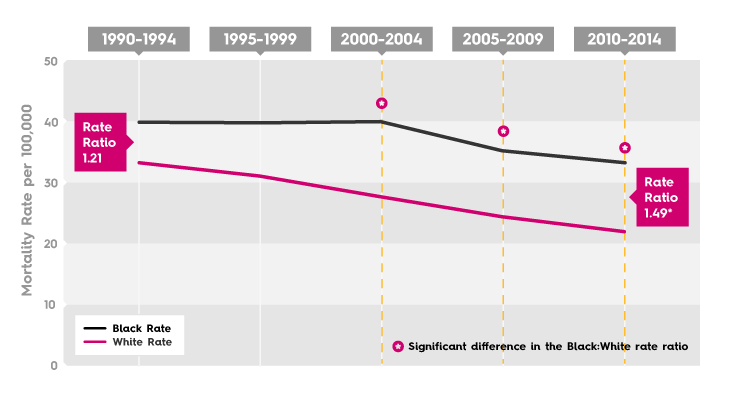 In other words, in the US, we observed a widening in the Black:White breast cancer mortality disparity over the 25-year interval. During the first 5-year interval (1990-1994), the Black rate was 42.9 and the White rate was 42.6, which produced a rate ratio of 1.01 (not statistically significant). During the last 5-year interval (2010-2014), the Black rate was 44.0 and the White rate was 20.2, which produced a rate ratio of 2.17 (statistically significant). During the first 5-year interval (1990-1994), the Black rate was 42.8 and the White rate was 31.5, which produced a rate ratio of 1.36 (not statistically significant). During the last 5-year interval (2010-2014), the Black rate was 39.0 and the White rate was 20.1, which produced a rate ratio of 1.94 (statistically significant). 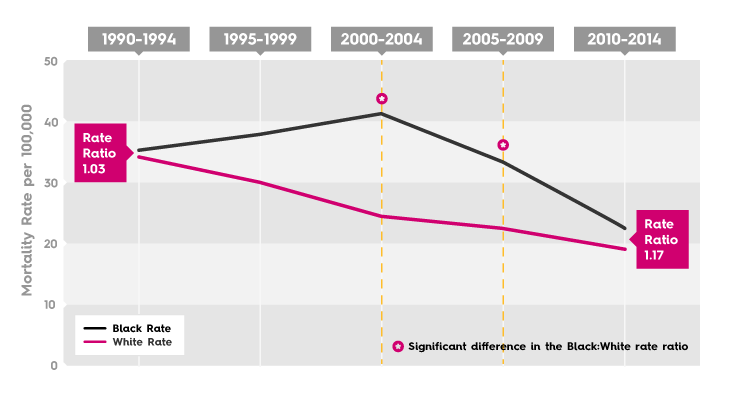 During the first 5-year interval (1990-1994), the Black rate was 37.2 and the White rate was 32.1, which produced a rate ratio of 1.16 (not statistically significant). During the last 5-year interval (2010-2014), the Black rate was 31.7 and the White rate was 26.5, which produced a rate ratio of 1.19 (not statistically significant). 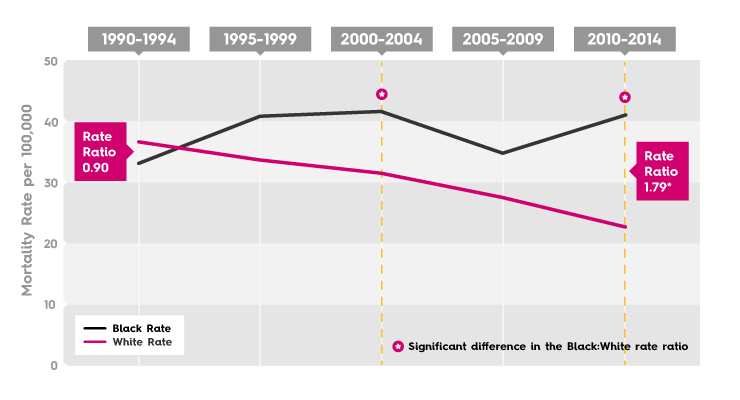 During the first 5-year interval (1990-1994), the Black rate was 37.0 and the White rate was 39.2, which produced a rate ratio of 0.94 (not statistically significant). During the last 5-year interval (2010-2014), the Black rate was 21.1 and the White rate was 20.9, which produced a rate ratio of 1.01 (not statistically significant). During the first 5-year interval (1990-1994), the Black rate was 39.1 and the White rate was 35.9, which produced a rate ratio of 1.09 (not statistically significant). During the last 5-year interval (2010-2014), the Black rate was 28.8 and the White rate was 21.6, which produced a rate ratio of 1.33 (statistically significant). 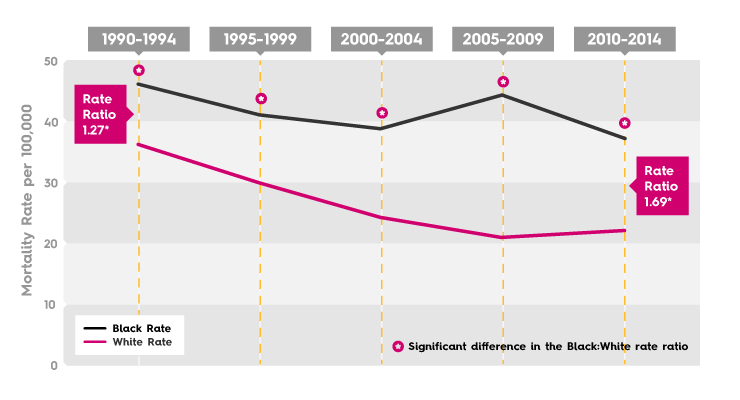 During the first 5-year interval (1990-1994), the Black rate was 41.7 and the White rate was 38.7, which produced a rate ratio of 1.08 (not statistically significant). During the last 5-year interval (2010-2014), the Black rate was 34.6 and the White rate was 22.6, which produced a rate ratio of 1.53 (statistically significant). During the first 5-year interval (1990-1994), the Black rate was 39.9 and the White rate was 40.1, which produced a rate ratio of 1.00 (not statistically significant). During the last 5-year interval (2010-2014), the Black rate was 31.0 and the White rate was 26.2, which produced a rate ratio of 1.18 (not statistically significant). 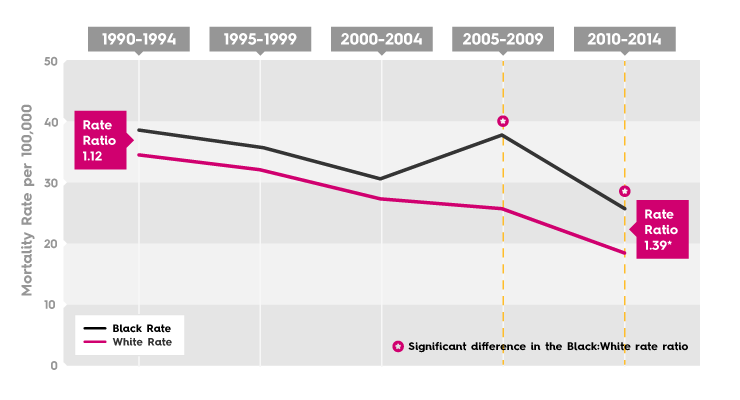 During the first 5-year interval (1990-1994), the Black rate was 34.0 and the White rate was 34.4, which produced a rate ratio of 0.99 (not statistically significant). During the last 5-year interval (2010-2014), the Black rate was 28.4 and the White rate was 22.6, which produced a rate ratio of 1.26 (statistically significant). During the first 5-year interval (1990-1994), the Black rate was 44.5 and the White rate was 32.0, which produced a rate ratio of 1.39 (statistically significant). During the last 5-year interval (2010-2014), the Black rate was 34.3 and the White rate was 19.6, which produced a rate ratio of 1.75 (statistically significant). 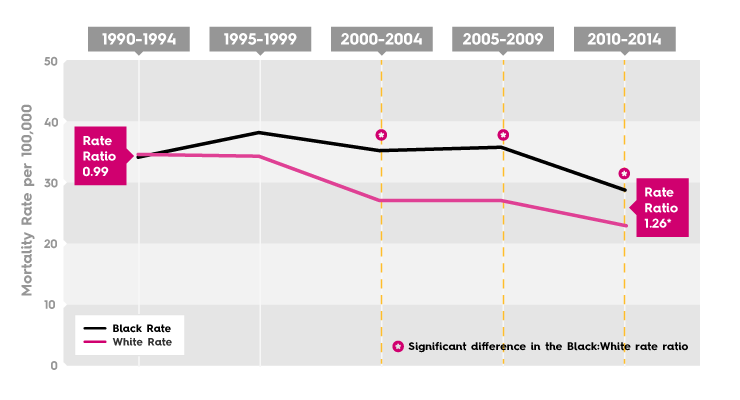 During the first 5-year interval (1990-1994), the Black rate was 37.9 and the White rate was 34.6, which produced a rate ratio of 1.10 (not statistically significant). During the last 5-year interval (2010-2014), the Black rate was 31.1 and the White rate was 21.8, which produced a rate ratio of 1.43 (statistically significant). During the first 5-year interval (1990-1994), the Black rate was 40.1 and the White rate was 30.6, which produced a rate ratio of 1.31 (statistically significant). During the last 5-year interval (2010-2014), the Black rate was 31.0 and the White rate was 24.2, which produced a rate ratio of 1.28 (not statistically significant). 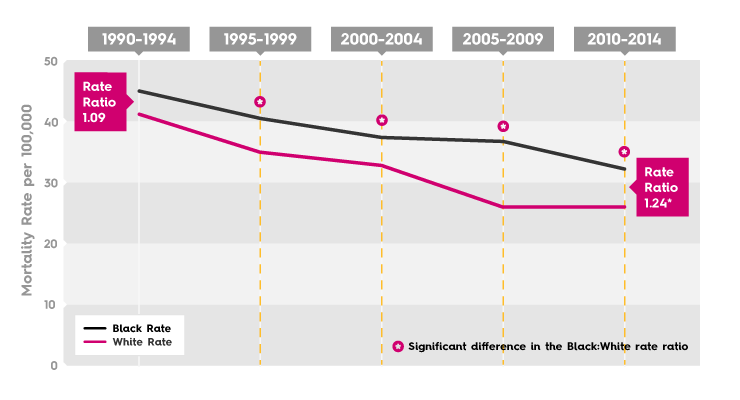 During the first 5-year interval (1990-1994), the Black rate was 40.1 and the White rate was 33.2, which produced a rate ratio of 1.21 (not statistically significant). During the last 5-year interval (2010-2014), the Black rate was 33.0 and the White rate was 22.1, which produced a rate ratio of 1.49 (statistically significant). During the first 5-year interval (1990-1994), the Black rate was 46.4 and the White rate was 40.2, which produced a rate ratio of 1.15 (statistically significant). During the last 5-year interval (2010-2014), the Black rate was 40.2 and the White rate was 26.8, which produced a rate ratio of 1.50 (statistically significant). 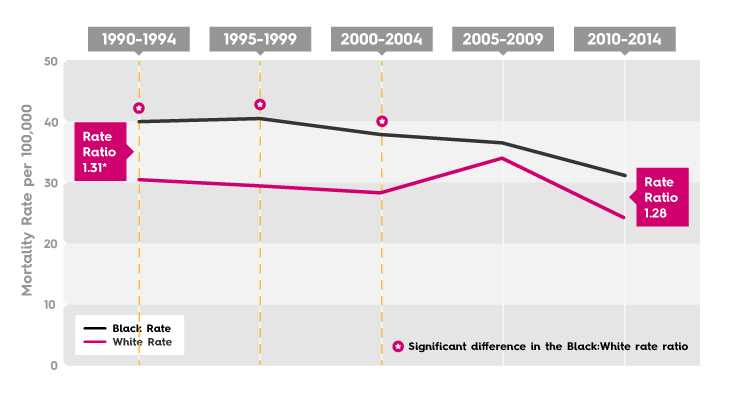 During the first 5-year interval (1990-1994), the Black rate was 38.6 and the White rate was 34.5, which produced a rate ratio of 1.12 (not statistically significant). During the last 5-year interval (2010-2014), the Black rate was 25.6 and the White rate was 18.4, which produced a rate ratio of 1.39 (statistically significant). 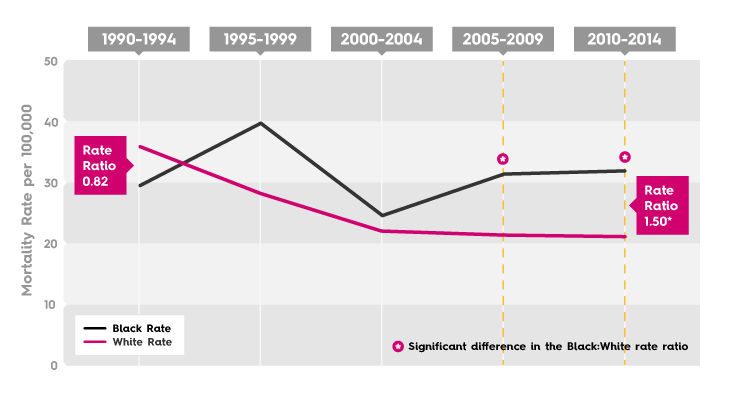 During the first 5-year interval (1990-1994), the Black rate was 31.7 and the White rate was 30.4, which produced a rate ratio of 1.04 (not statistically significant). During the last 5-year interval (2010-2014), the Black rate was 29.6 and the White rate was 22.4, which produced a rate ratio of 1.32 (statistically significant). During the first 5-year interval (1990-1994), the Black rate was 37.3 and the White rate was 34.1, which produced a rate ratio of 1.09 (not statistically significant). During the last 5-year interval (2010-2014), the Black rate was 38.9 and the White rate was 22.0, which produced a rate ratio of 1.77 (statistically significant). During the first 5-year interval (1990-1994), the Black rate was 44.4 and the White rate was 44.3, which produced a rate ratio of 1.00 (not statistically significant). During the last 5-year interval (2010-2014), the Black rate was 49.2 and the White rate was 45.0, which produced a rate ratio of 1.09 (not statistically significant). During the first 5-year interval (1990-1994), the Black rate was 43.7 and the White rate was 38.6, which produced a rate ratio of 1.13 (not statistically significant). During the last 5-year interval (2010-2014), the Black rate was 36.0 and the White rate was 28.9, which produced a rate ratio of 1.24 (not statistically significant). 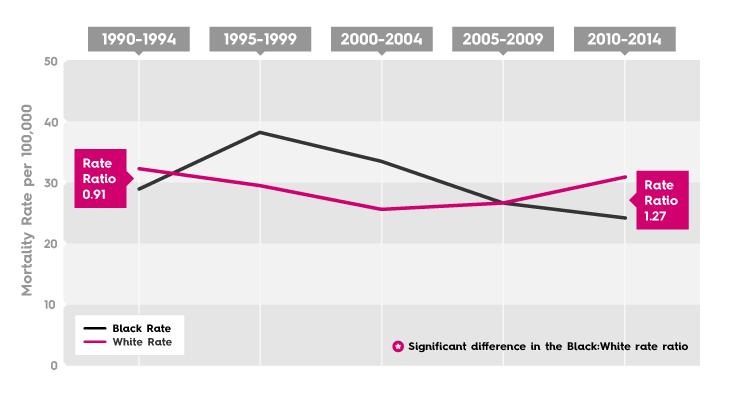 During the first 5-year interval (1990-1994), the Black rate was 45.1 and the White rate was 36.5, which produced a rate ratio of 1.24 (statistically significant). During the last 5-year interval (2010-2014), the Black rate was 40.3 and the White rate was 24.1, which produced a rate ratio of 1.67 (statistically significant). 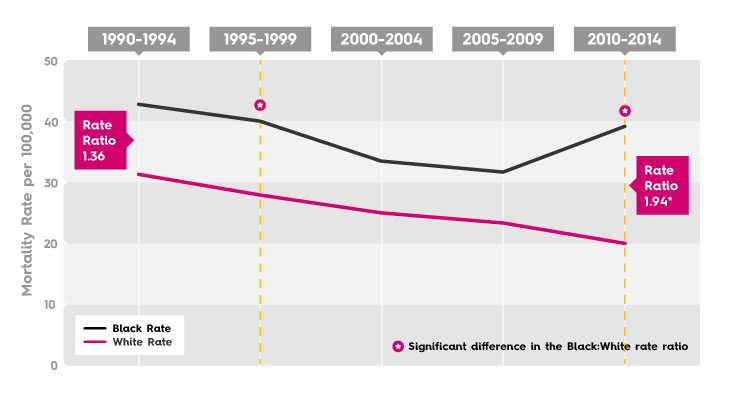 During the first 5-year interval (1990-1994), the Black rate was 46.3 and the White rate was 36.4, which produced a rate ratio of 1.27 (statistically significant). During the last 5-year interval (2010-2014), the Black rate was 37.5 and the White rate was 22.2, which produced a rate ratio of 1.69 (statistically significant). During the first 5-year interval (1990-1994), the Black rate was 52.1 and the White rate was 58.7, which produced a rate ratio of 0.89 (not statistically significant). During the last 5-year interval (2010-2014), the Black rate was 60.2 and the White rate was 64.4, which produced a rate ratio of 0.94 (not statistically significant). During the first 5-year interval (1990-1994), the Black rate was 35.5 and the White rate was 37.7, which produced a rate ratio of 0.94 (not statistically significant). During the last 5-year interval (2010-2014), the Black rate was 35.2 and the White rate was 25.8, which produced a rate ratio of 1.36 (statistically significant). During the first 5-year interval (1990-1994), the Black rate was 38.0 and the White rate was 36.9, which produced a rate ratio of 1.03 (not statistically significant). During the last 5-year interval (2010-2014), the Black rate was 20.4 and the White rate was 18.5, which produced a rate ratio of 1.11 (not statistically significant). During the first 5-year interval (1990-1994), the Black rate was 36.2 and the White rate was 30.8, which produced a rate ratio of 1.18 (statistically significant). During the last 5-year interval (2010-2014), the Black rate was 28.2 and the White rate was 22.3, which produced a rate ratio of 1.27 (statistically significant). During the first 5-year interval (1990-1994), the Black rate was 36.3 and the White rate was 32.7, which produced a rate ratio of 1.11 (not statistically significant). During the last 5-year interval (2010-2014), the Black rate was 28.0 and the White rate was 25.2, which produced a rate ratio of 1.11 (not statistically significant). During the first 5-year interval (1990-1994), the Black rate was 31.7 and the White rate was 30.0, which produced a rate ratio of 1.05 (not statistically significant). During the last 5-year interval (2010-2014), the Black rate was 34.2 and the White rate was 21.8, which produced a rate ratio of 1.56 (statistically significant). 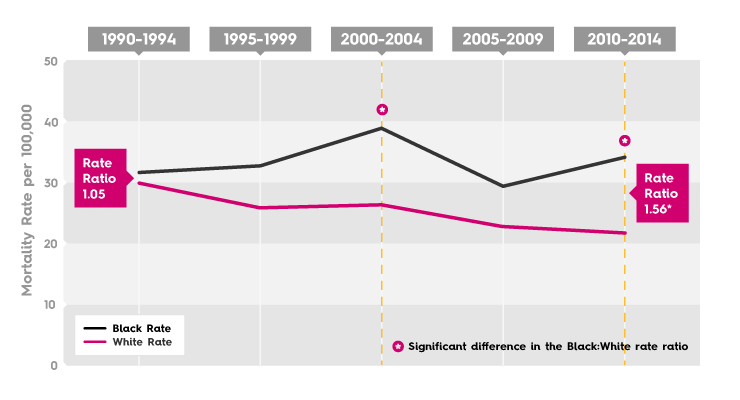 During the first 5-year interval (1990-1994), the Black rate was 37.1 and the White rate was 32.1, which produced a rate ratio of 1.16 (not statistically significant). During the last 5-year interval (2010-2014), the Black rate was 35.4 and the White rate was 24.9, which produced a rate ratio of 1.42 (statistically significant). During the first 5-year interval (1990-1994), the Black rate was 44.9 and the White rate was 41.2, which produced a rate ratio of 1.09 (not statistically significant). During the last 5-year interval (2010-2014), the Black rate was 32.2 and the White rate was 26.1, which produced a rate ratio of 1.24 (statistically significant). During the first 5-year interval (1990-1994), the Black rate was 35.3 and the White rate was 34.2, which produced a rate ratio of 1.03 (not statistically significant). During the last 5-year interval (2010-2014), the Black rate was 22.3 and the White rate was 19.1, which produced a rate ratio of 1.17 (not statistically significant). During the first 5-year interval (1990-1994), the Black rate was 29.4 and the White rate was 35.7, which produced a rate ratio of 0.82 (not statistically significant). During the last 5-year interval (2010-2014), the Black rate was 31.7 and the White rate was 21.1, which produced a rate ratio of 1.50 (statistically significant). During the first 5-year interval (1990-1994), the Black rate was 48.4 and the White rate was 66.9, which produced a rate ratio of 0.72 (not statistically significant). During the last 5-year interval (2010-2014), the Black rate was 42.0 and the White rate was 41.8, which produced a rate ratio of 1.00 (not statistically significant). 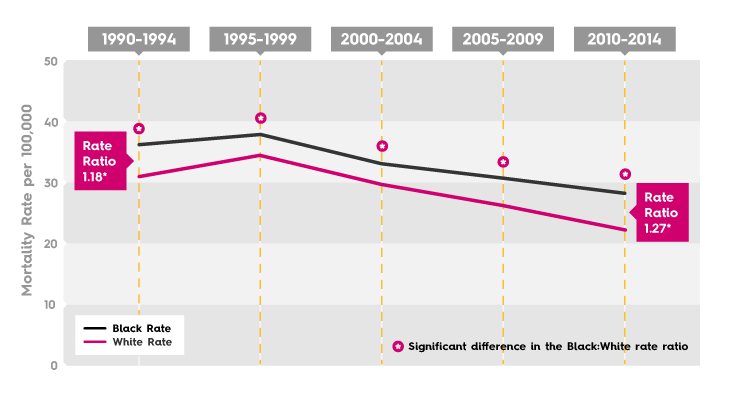 During the first 5-year interval (1990-1994), the Black rate was 33.0 and the White rate was 36.7, which produced a rate ratio of 0.90 (not statistically significant). During the last 5-year interval (2010-2014), the Black rate was 40.9 and the White rate was 22.8, which produced a rate ratio of 1.79 (statistically significant). During the first 5-year interval (1990-1994), the Black rate was 48.9 and the White rate was 33.8, which produced a rate ratio of 1.45 (statistically significant). During the last 5-year interval (2010-2014), the Black rate was 29.1 and the White rate was 22.5, which produced a rate ratio of 1.29 (not statistically significant). 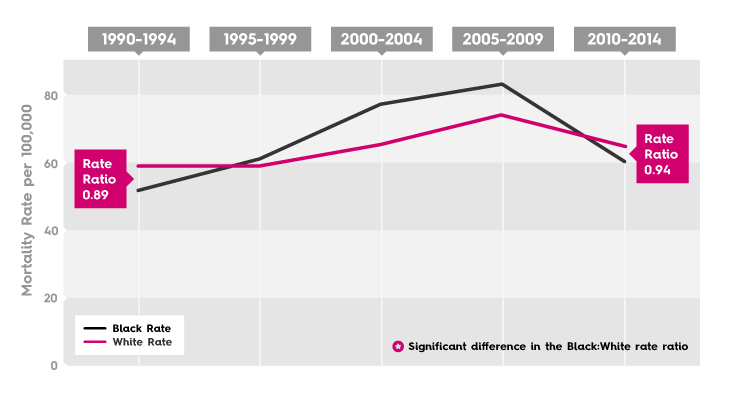 During the first 5-year interval (1990-1994), the Black rate was 47.3 and the White rate was 35.6, which produced a rate ratio of 1.33 (statistically significant). During the last 5-year interval (2010-2014), the Black rate was 29.5 and the White rate was 20.0, which produced a rate ratio of 1.47 (statistically significant). During the first 5-year interval (1990-1994), the Black rate was 31.0 and the White rate was 34.4, which produced a rate ratio of 0.90 (not statistically significant). During the last 5-year interval (2010-2014), the Black rate was 26.2 and the White rate was 25.1, which produced a rate ratio of 1.05 (not statistically significant). During the first 5-year interval (1990-1994), the Black rate was 31.5 and the White rate was 32.9, which produced a rate ratio of 0.96 (not statistically significant). During the last 5-year interval (2010-2014), the Black rate was 32.7 and the White rate was 25.2, which produced a rate ratio of 1.30 (not statistically significant). 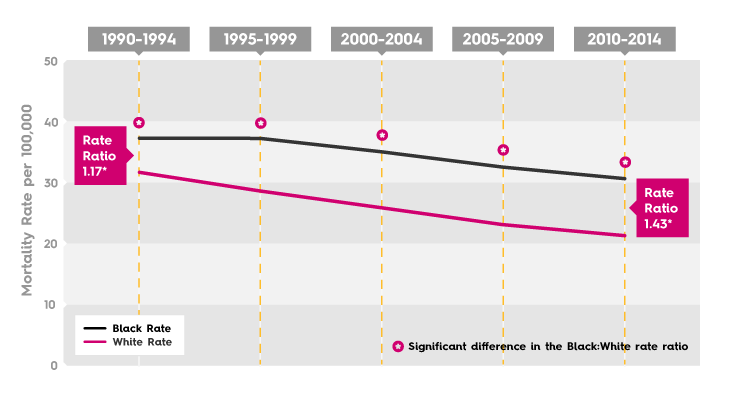 During the first 5-year interval (1990-1994), the Black rate was 28.9 and the White rate was 32.0, which produced a rate ratio of 0.91 (not statistically significant). During the last 5-year interval (2010-2014), the Black rate was 30.8 and the White rate was 24.2, which produced a rate ratio of 1.27 (not statistically significant). 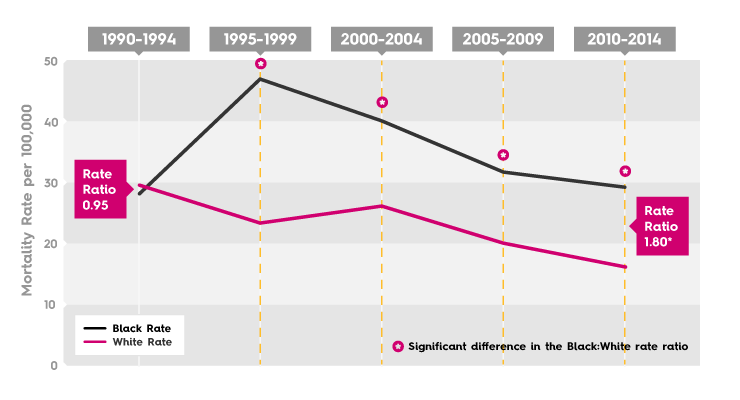 During the first 5-year interval (1990-1994), the Black rate was 46.1 and the White rate was 33.2, which produced a rate ratio of 1.39 (statistically significant). During the last 5-year interval (2010-2014), the Black rate was 34.4 and the White rate was 24.0, which produced a rate ratio of 1.43 (statistically significant). 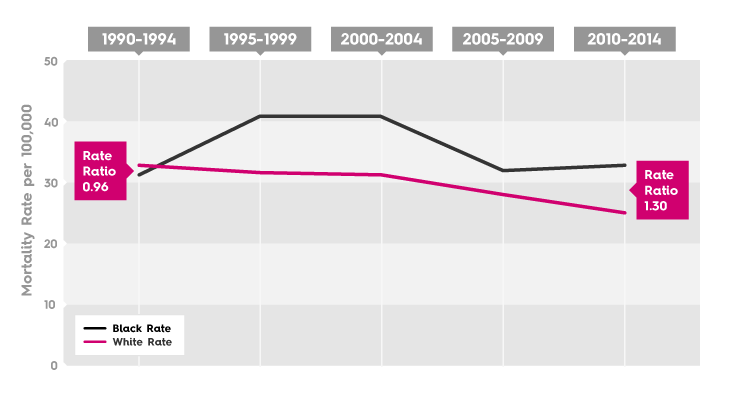 During the first 5-year interval (1990-1994), the Black rate was 33.8 and the White rate was 35.5, which produced a rate ratio of 0.95 (not statistically significant). During the last 5-year interval (2010-2014), the Black rate was 35.2 and the White rate was 19.5, which produced a rate ratio of 1.80 (statistically significant).